The International Day of Action to Protect Rivers was relatively peaceful at our northern latitudes, where rivers are still covered with ice. It consisted of five environmental education events, two public lectures and two petitions released to mass-media. Such relative quietness in part is a consequence of wise and timely decision by the giant corporation RusHydro not to pursue any new sizeable hydropower projects in coming years. Previous RusHydro’s CEO Evgeny Dod has been under arrest since last year for alleged embezzlement of 370 million rubles (USD 5 million). The new management team is struggling to pay back enormous debts made in the years of rampant power plant construction and to complete (or freeze) construction of unfinished projects, some of which, like Ust-Srednikanskaya Hydro on Kolyma River, are unlikely to see any demand for their energy in decades. 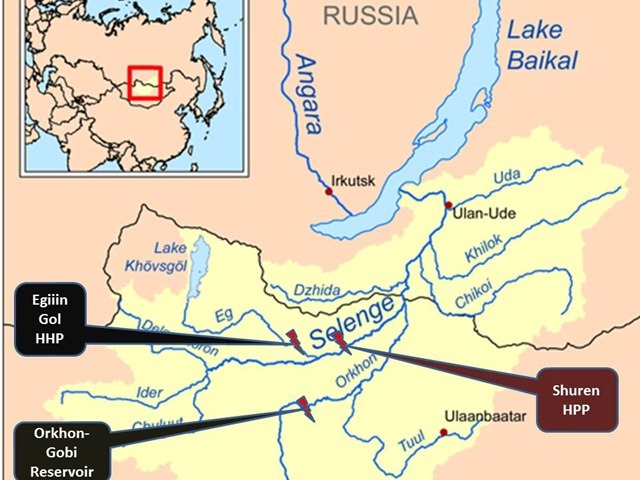 Unofficial water truce has formed between domestic hydropower monster and Russian environmental activists, at least for the time being. But transboundary basins shared with China and Mongolia harbor several hydrodam proposals threatening freshwater biodiversity and well-being of local communities. They are also prone to corruption and risks of developing long-term bad debts for their initiators. So these were the threats that fueled public sentiment on the Day of Action for Rivers. On March 14 the RwB Coalition again highlighted the fact that Lake Baikal basin is threatened by several planned hydropower dams in Selenge River in Mongolia. For two of those dams the World Bank supports feasibility studies and facilitates search for investors through the MINIS Project, which under public pressure was finally forced to organize public consultations in Russia at the end of March 2017. The third and the largest of dams – Egiin Gol Hydro – has been conceived with support of the ADB and then design was enlarged by the French Engie Corporation using Mongolia’s own financial resources gained by issuance of "Chinggis Bonds" managed by the Development Bank of Mongolia (DBM) along with 15 more industrial and infrastructure megaprojects. This Bank’s management (its CEO also has been under arrest since last year), has significant responsibility for the sad fact that the debt of the government and state companies of Mongolia reached USD 11-billion and exceeds country’s GDP, which brought the Mongolia on the verge of default. Nine projects , including Egiin Gol Hydro, on which the DBM has spent more than USD 500 million were considered by auditors non-performing, while investigation revealed that at least 8 million dollars were subject to fraud and embezzlement. In case of Egiin Gol Hydro embezzlement likely exceeded USD 600 000, mostly paid as salaries, according to Mongolian media. Investigation on Development Bank of Mongolia also revealed that in some cases (Egiin Gol Hydro included ) there was double funding of certain works\contracts from several sources. Funding of design stage of industrial megaprojects from several different sources is common practice in Mongolia. For example, many projects of the Development Bank of Mongolia target the same industrial facilities as the World Bank’s MINIS Project. It does not necessarily mean that any embezzlement of fraud has actually already happened, but certainly increases risks of "double-funding". Large hydro-engineering projects present the greatest threat to Mongolian national finance. Early conservative cost estimate for two dams pushed by the WB MINIS Project is more than USD 2 billion, while in 2015 China Exim Bank offered (and then has frozen) a 1 billion loan for construction of the Egiin Gol Hydro and auxiliary infrastructure. Considering usual cost overruns, which for dams often reach 200%, borrowing for such hydropower projects can easily bring the economy of Mongolia to a collapse and cause significant suffering to ordinary citizens. Rivers without Boundaries used the Day of Action to Protect Rivers to remind about this direct link between the health of our rivers and health of the national economy of Mongolia. On the same day the WWF Russia issued a strong statement to protect the Amur River -the largest free flowing transboundary river of Russia and China. Petr Osipov, the Director of WWF Amur Branch, stresses that "Amur has a right to remain free flowing, which is also documented in the Comprehensive River Basin Management Scheme adopted in 2014 in Russia. The Scheme contains clear statement that warns against development of any dam on transboundary main channel of the Amur River". WWF reiterates multiple catastrophic consequences expected as a result of damming the Amur: disruption of environmental flows, blocking navigation, depriving lower reaches from vital supply of sediments which will provoke erosion and sinking, deadly threat for water birds and migratory fish, including sturgeons and salmon. This statement by the WWF was triggered by continuing attempts of the "new clean energy" company Hanergy to revive an old plan for a giant dam to harness flow of the greatest untamed river of Asia. In 2016 the company approached the Russian Ministry for Development of the Far East with such irresponsible project idea, which has been rejected at least 4 times in last 50 years. The company did so not because it has hydropower expertise or tremendous investment resources, but because it needs to raise its profile after suffering a severe failure at Hong Kong Stock Exchange. The Securities and Futures Commission of Hong Kong now is seeking legal action to disqualify five former and current directors of the solar energy firm Hanergy Thin Film Power Group , including the company’s founder and former chairman Li Hejun, from being directors or being involved in the management of any Hong Kong corporation for up to 15 years. They failed to take proper steps to recover the receivables by putting the interests of the connected parties before that of HanergyTF, and so did not act in Hanergy’s best interest, according to a statement released by the SFC . The SFC is also seeking a court order to require Hanergy’s parent company－Hanergy Holding Group Ltd (Chairman Li Hejun)－the one that threatened to dam the Amur River – pay all outstanding receivables due to Hanergy under various sales contracts and execute a guarantee securing their payment. The first hearing of the petition will be in the Court of First Instance on May 21, 2017. The trading of Hanergy shares has been suspended for more than one and a half years. These stories told on the Day of Action to Protect Rivers show that initiators and beneficiaries of large hydropower projects are very often linked to major cases of corruption and fraud. Keep our rivers free of dams and our societies free of corruption and bad debts!! !